The 35th Infantry Regiment Association salutes our fallen brother, PFC Leland Ford Smith, RA23021038, who died in the service of his country on November 28th, 1950 in North Korea. The cause of death was listed as Captured-Died POW. At the time of his death Leland was 18 years of age. He was from Angola, Indiana. Leland's Military Occupation Specialty was 4745-Light Weapons Infantryman. The decorations earned by PFC Leland Ford Smith include: the Combat Infantryman Badge, the Purple Heart, the National Defense Service Medal, the Korean Service Medal, the United Nations Korea Service Medal, and the Republic of Korea War Service Medal. Corporal Smith was a member of Company K, 3rd Battalion, 35th Infantry Regiment, 25th Infantry Division. He was seriously wounded by the enemy in South Korea on September 23, 1950 and returned to duty on November 11, 1950. He was taken Prisoner of War while fighting the enemy in North Korea on November 28, 1950 and died while a prisoner at Camp 5, North Korea on February 28, 1951. His remains were not initially recovered. Corporal Smith was awarded the Purple Heart, the Combat Infantrymans Badge, the Prisoner of War Medal, the Korean Service Medal, the United Nations Service Medal, the National Defense Service Medal, the Korean Presidential Unit Citation and the Republic of Korea War Service Medal. Lelands remains were identified in 2014. 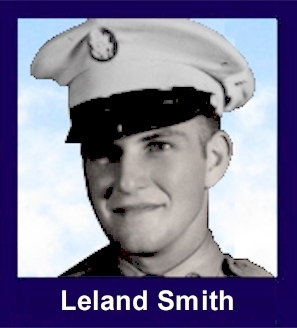 Leland Ford Smith, 18, of Angola, Indiana died February 28, 1951. He was a Prisoner of War in Korea. Leland was a Corporal in the United States Army 35th Infantry Regiment, K CO 3 BN, 25th Infantry Division. He was taken prisoner while fighting the enemy in North Korea on November 28, 1950 and died while in prison Camp #5 in North Korea on February 28, 1951. He was born May 17, 1932 in Angola, Indiana to Willard and Bernice (Heckman) Smith. Leland is survived by his three sisters, Luella Root of Angola, Laura Short of Angola and Ruth Ann Tatro of Auburn along with several nieces and nephews. His parents, brothers Bernie Smith and Willard D. "Butch" Smith and sister Patty Smith has since passed away. Military Graveside services will be at 11:30 AM, Monday, December 8, 2014 at Jamestown Cemetery, Fremont, Steuben County, Indiana. Visitation will be from 10-11 AM, Monday, December 8, 2014 at the Weicht Funeral Home, Angola. Memorials may be made in Lelands memory to the Wounded Warriors Project. (by Bill Henson) A long, but rewarding day in Indiana. Steve Blaugh, Larry Curtis, Wiley Dodd and I attended the services and funeral for Cpl. Leland Smith. All traffic in the town of Angola and along the route to the cemetery stopped as the mile-long funeral procession traveled to our Cacti brothers final resting place. Three of Lelands sisters were in attendance, as well as nephews and great-nephews. He was buried with full military honors. Fifty or more Patriot Guard riders lead the procession. Larry Curtis presented the family letters of condolence and challenge coins from the Association during ceremonies at the funeral home. Larry did well. The familys long wait has ended.